Pages from the Encylcopedia of Local Knowledge: Chapter Two. 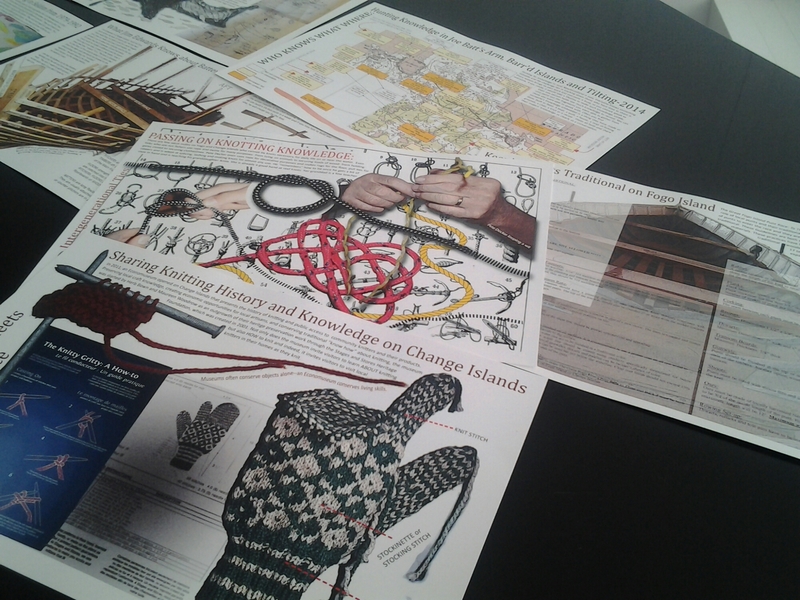 Knowledge from Fogo and Change Islanders compiled by Pam Hall. As a teacher, particularly in my post graduate studies, I’ve had many conversations and read many articles about literacy and learning and how we measure and value knowledge. Knowledge to me means you know how to do something or explain something. It’s not memorizing an answer for a standardized test or chapter test. It’s having an ability to take something known and apply it to a new situation and problem-solve or improvise. Knowledge is shared between people but not all knowledge is valued appropriately in modern times. Knowing how to build a fire isn’t valued until you need one. Cod tongues and cheeks, but you knew that, right? 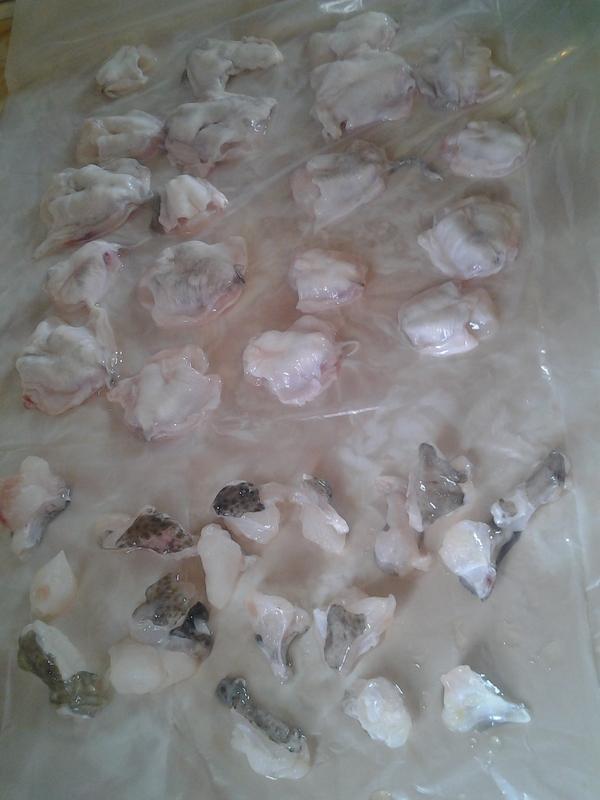 Knowing how to clean a fish and cut out tongues isn’t valued until you catch one. As part of her Post –Doctorial Research, Pam Hall is collecting knowledge. She’s not writing what she knows or preparing tests to measure others, she’s asking questions and watching and listening and recording local knowledge. I don’t know if she’s ever bottle caribou or made a quilt but she knows someone who can and who will share the knowledge. Zita Cobb introduced Pam Hall and the Encyclopedia of Local Knowledge, Chapter Two. The Encyclopedia of Local Knowledge now has two Chapters. Chapter One is about the areas of Bonne Bay and the Great Northern Peninsula. 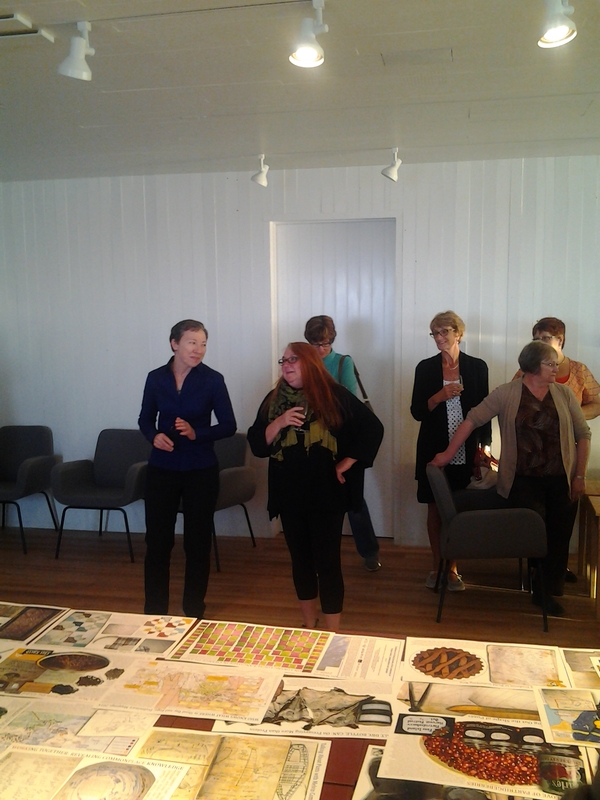 Last week I was lucky to attend the reception of Chapter Two: Fogo and Change Islands as it was delivered to the community of Fogo Island. Working as a Research Resident under a Memorandum of Understanding between Shorefast Foundation and Memorial University of Newfoundland, Pam Hall has compiled a collection of over 70 posters of local knowledge. She spent months documenting the knowhow that has enabled Island residents to survive hundreds of years using what the land provides and their abilty to build, grow, fish, hunt and preserve, among other critical skills. 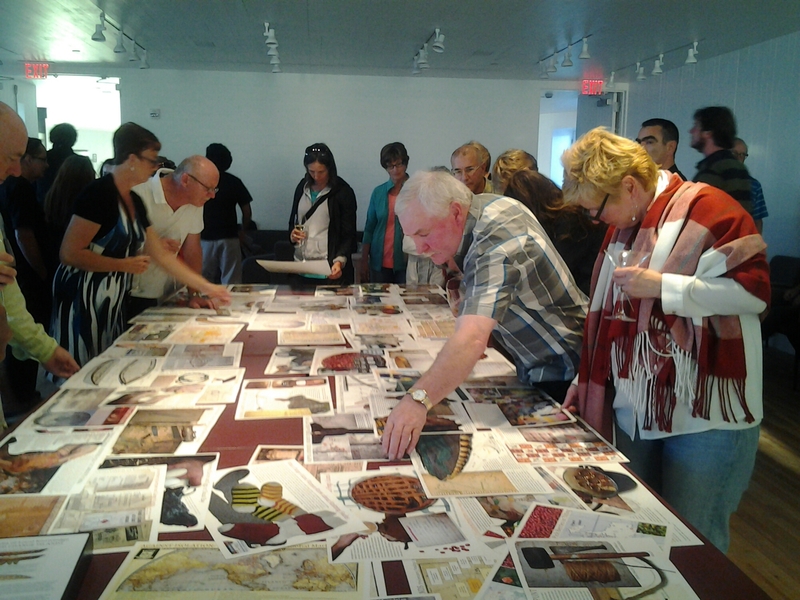 A collection of panels, each concise in the specific talent and knowledge shared, was put on display for Island residents. I wasn’t sure what to expect, I guess expecting a book, but the finished product is much more tactile and ready to share. 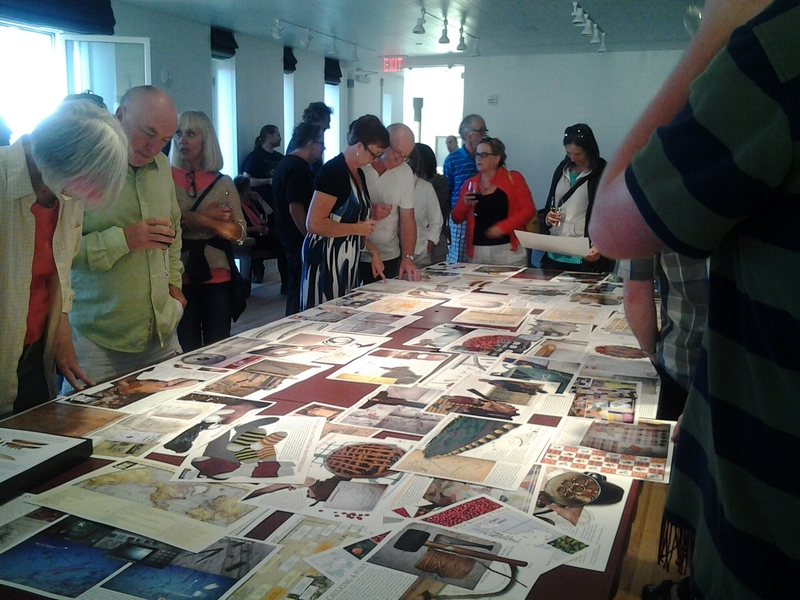 People crossed the room with prints to share them with friends with similar interests. Just the way we share knowledge. 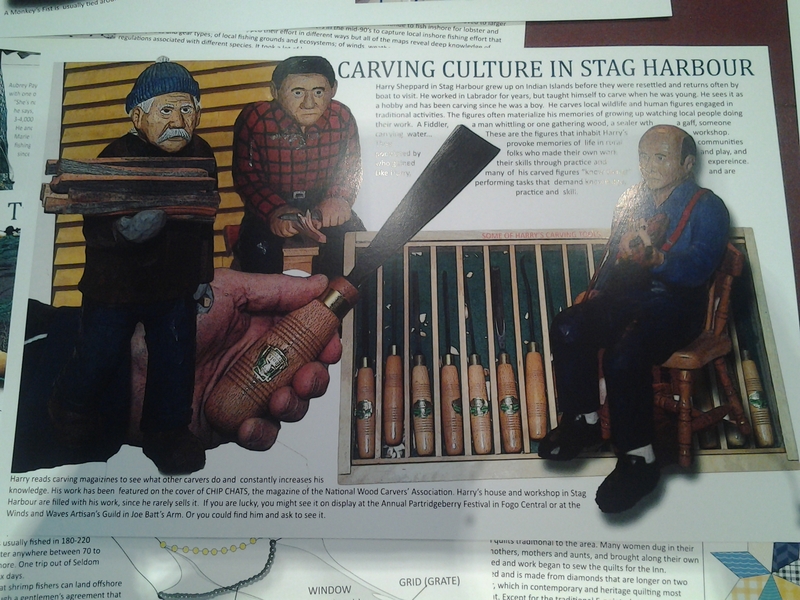 Residents who contributed from Change and Fogo Island were each given a copy of their ‘page’. The whole collection is a treasury of directions, images, diagrams and maps with explanations of skills ranging from berry picking to boat building. This is critical literacy. Critical to the understanding of the place and the people of Newfoundland, particularly residents and past residents of Fogo and Change Islands. Wood carving by Harry Sheppard. I did not realize how many people were involved in Pam’s three and a half months of interviews but many familiar names were featured on the panels and they were featured for the many talents they have such as quilting, building or baking. I quickly spotted the beautiful carving by Harry Sheppard. 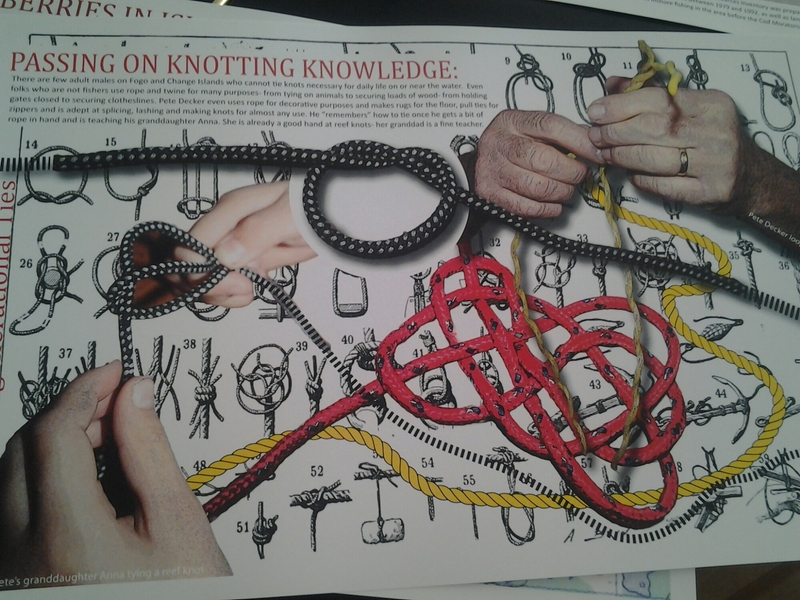 Knotting knowledge passed by Peter Decker to his grand daughter Anna. One of the most striking panels for me was about knot tying. I realized at the reception that the two sets of hands shown were those of Peter Decker and his granddaughter Anna. As one of the youngest participants in the Encyclopedia of Local Knowledge, she has learned this, and many other skills I’m sure, from her grandfather. Knowledge is passed down and learned by doing, not just by reading about it. So much knowledge! 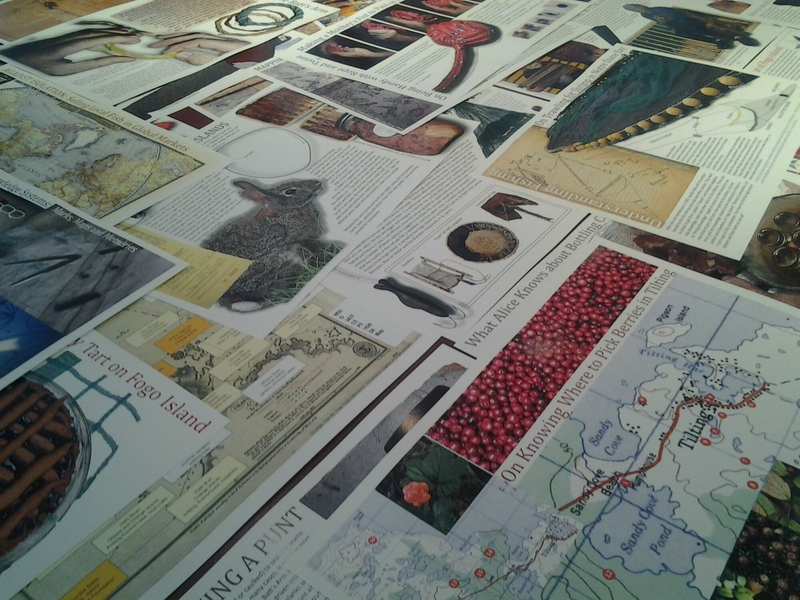 Some of ‘what we know now to live here’ as described by researcher and artist Pam Hall. Anna has not only seen her grandfather use these knots but she has taken the time to sit with him and learn to tie them herself. I’m sure she knows the names and best uses of each and I’m sure if I had time to look through the Encyclopedia with her, she can also explain a lot more aspects of local knowledge too. Pam Hall and Anna discussing the Encyclopedia of Knowledge. In school, she’s taught critical literacy skills that get measured in various ways. 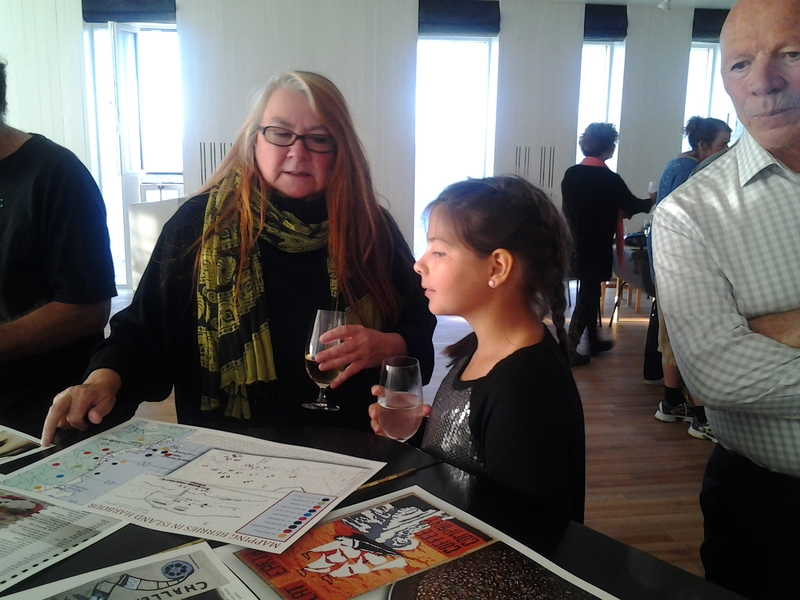 In growing up on Fogo Island and experiencing the traditions of boats, fishing and even attending receptions at the Fogo Island Inn, she is valuing knowledge critical to understanding her heritage and family traditions. That knowledge doesn’t need to be measured. It needs to be shared. In addition to tradition, current knowledge and practice is also importantly documented. New vegetables grown in old gardens is an example. We made an overnight trip to Fogo just to see this project. It can be viewed again at the Fogo Island Partridgeberry Harvest Festival. 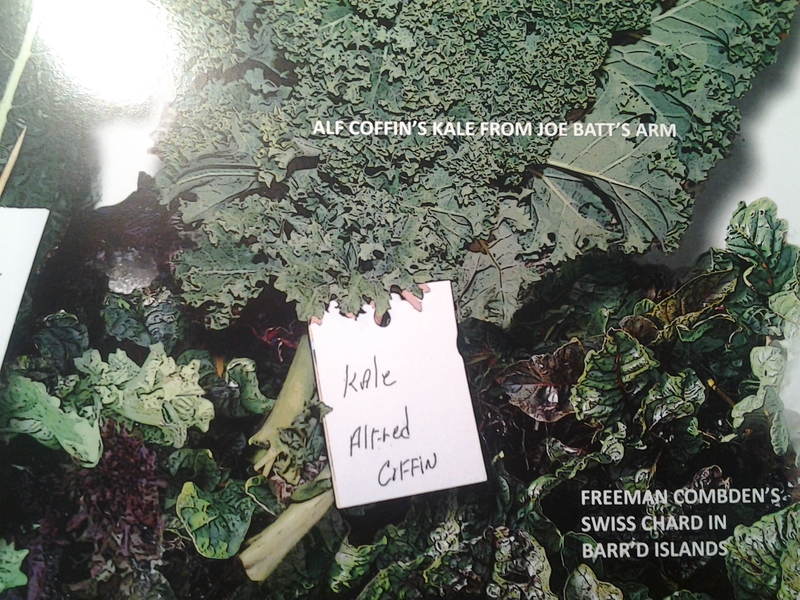 A limited number of print copies are now owned by Fogo Island. There will be a copy in the Dr. Leslie Harris Memorial Library at the Fogo Island Inn and another in the Public Library and the school. Printing of this work in limited numbers was made possible by funding from the Newfoundland Arts Council. The Encyclopedia of Local Knowledge will be put on line in the fall to share with the world and I’ll add a link to this post when it becomes available. It is truly a remarkable achievement. I look forward to reading it more thoroughly and following this exceptional research by Pam Hall. Encyclopedia of Knowledge Chapter One can be found here.